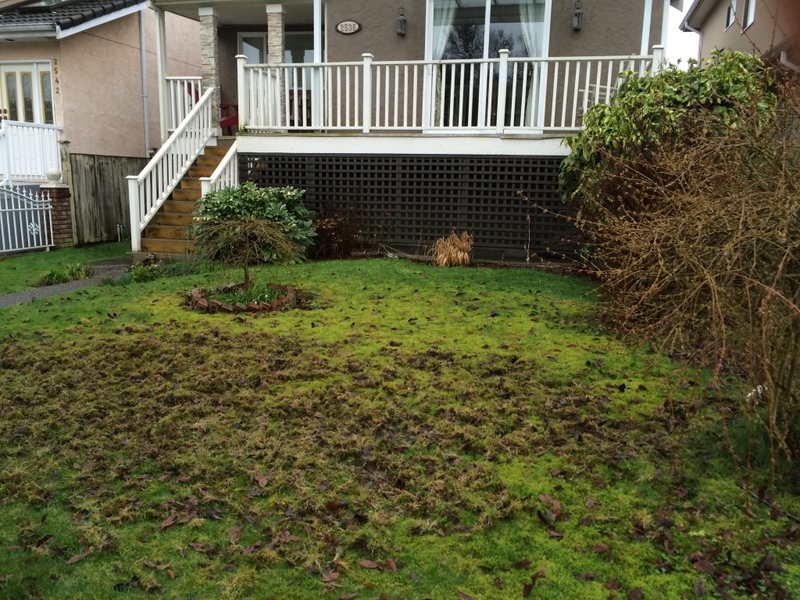 There are a lot of issues involved in keeping a pretty lawn here in coastal BC. First of all, the explosion of European Chafer Beetle in the last 8 years has seen many lawns decimated as tho’ someone had taken a rototiller to them. 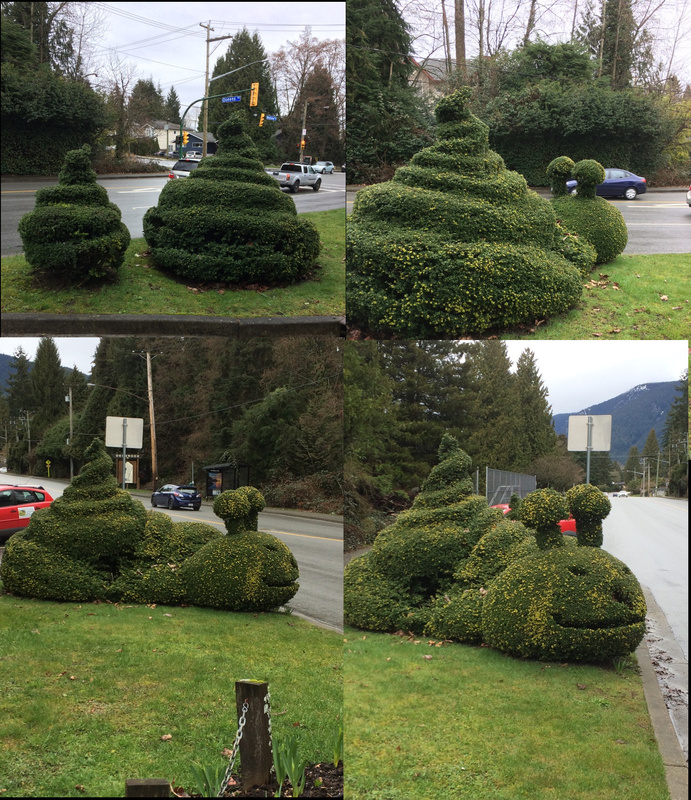 My “lawn” Dec 31 2014. Lots and LOTS of racoon damage–they are searching for Chafer Beetle grubs, and clearly they’re finding them… Click on the picture for a good look at what they did! Next there’s “summer dry” (can’t call it “drought” when we’ve seen what real drought is like! 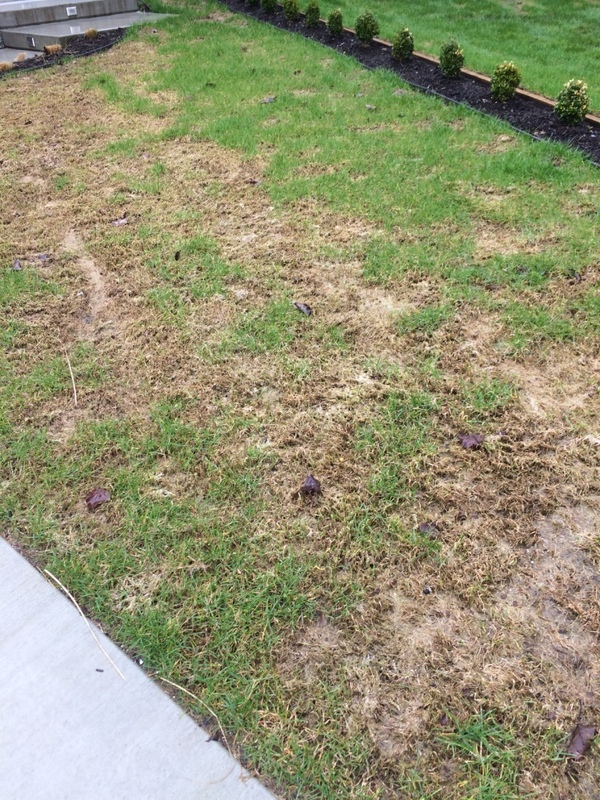 ), and our expectation of watering restrictions. Even without “dry” we have the restrictions, but you (may) remember the summer of 2015 when we were perilously close to Level 4 restriction, which would have prohibited watering even vegetable gardens! I know–crazy! Then there’s the increasing awareness of the environmental cost of fertilizers and pesticides. And I’m not even going to differentiate between “chemical” and “organic” because a. they’re all “chemical” (everything is chemical! ), and b. so-called “organic” products can be as dangerous as the …other… products. What else? Well I guess this year there’s “Snow mould”–a fungal disease that I’ve never seen before, and I understand is related to number of days of snow coverage. We’ve had more snow coverage in most parts of coastal BC than I’ve seen in my 35 years here. Will it happen again? Probably, so we should know something about its management. So the following management protocol is going to address all the above concerns. I’ll try to explain as I go along, so this may be a pretty word-intensive post. Crow damage due to Chafer Beetle infestation. Maybe moss, like above, if your lawn is shaded by a tree canopy or your house, or your neighbour’s house. Lawn turf consists of lots of individual grass plants, most of which multiply vigorously by means of running “rhizomes”. If you’ve had to remove grass from your garden beds, you’ll find strings of roots, with little grass plants sprouting up intermittently. That’s what they’re supposed to do in the lawn. Which incidentally is what they will do at the edge of the lawn as it interfaces with your perennial border. I edged my own garden beds with bricks, but those determined grass rhizomes creep along the brick until they find the gap between two, and scoot in between to find really great growing medium. Now I always edge client’s lawns with some kind of either decorative or invisible border (not horrible black plastic!) and then often a soldier course of stone. If your turf looks like either of the above pictures, it’s not recoverable. Yes, you could remove all the debris, fill up the holes with turf-blend soil, and over seed. But getting it even, level, and somewhat matching will be a challenge. Both lawns were removed completely and replaced with “something completely different”. But assuming your lawn isn’t that bad, Spring calls for clean-up, soil-feeding, and grass boosting. There seems to be a lot of Snow Mould out there. It looks like a layer of matted dead grass. Since I was completely unfamiliar with it–it’s uncommon here in coastal BC, but with the prolonged snow cover, the fungus had a field day taking hold–I had to do a fair amount of research to understand it and learn how to manage it. Gently rake over the lawn to remove as much debris as possible without ripping up the roots. 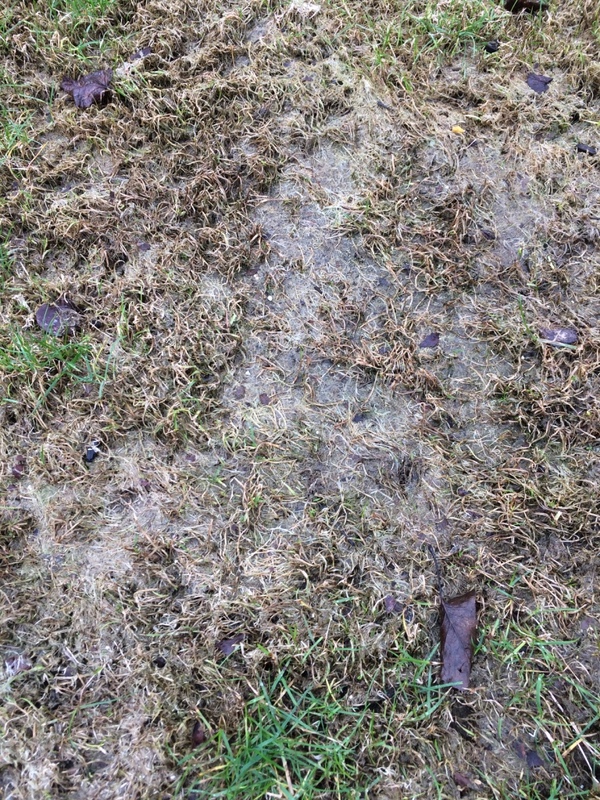 For the homeowner it’s unlikely the snow mould has killed the grass, but as long as the ground is cold and wet, the fungus is probably still proliferating. Raking up as much as possible will decrease the “disease load”. This looks like surface water, but it’s a film of fungal growth sitting on top of matted grass. If you’ve got a lot of moss in your lawn, you’re going to be tempted to try to rake that out as well. I recommend against trying! Moss growth is a function of moisture, shade, and to a lesser extant, low pH. Because of our constant rain, our native soil here is acidic. Not severely acidic, but enough to encourage moss growth and discourage turf grass growth. The same rain also keeps the ground wet for long periods of time–like 10 months of the year! And the same rain makes trees grow big, providing lots of shade. W can’t do much about the rain, but we can improve drainage, light, and pH. Which brings us to soil feeding. Contented soil–that is, the soil that will support great turf grass–is almost neutral pH–around 6-6.5, well-drained, with organic matter comprising 5-10% (less than many people think is optimum), having been exposed to little if any fast-acting/water-soluble fertilizer and little to no pesticides/herbicides. When I first moved into my current home, I found NO earthworms in the ground when I dug into it. The lawn had probably only ever been treated with fast-acting “weed-and-feed” products which would have killed many of the organisms in the soil and promoted green top-growth of grass at the expense of deep roots. Fast-acting and water-soluble fertilizers are also main culprits in the algae bloom problems of local waterways because the turf will never use up the products as fast as they are being washed into the groundwater or storm drains. The soil was also pretty sandy, so for sure the lawn was never top-dressed with compost. Aerating is something that will benefit most lawns. If you have relatively heavy soil, or the lawn experiences a lot of foot traffic, or it’s a new construction, or for any number of reasons, your soil may be compacted. This decreases the actual air pockets and therefore the available oxygen in the soil, so there’s less life down there! And life is what you want. Core aerating is when you go all over the lawn with a tool or machine that takes goose-poo sized “cores” out of the ground, usually around 10-20 per square foot. You can do it with a funny tool that you step on Like this Hound Dog, which I’ll readily warn you is a lot of work, especially if, like me, you have a lot of stones in your ground. But if it’s a smallish space, and since you’re only doing it once every year or two, it’s the simplest. Alternatively you can rent a power core aerator. What you don’t want to do is just “spike” the lawn without actually removing cores; in that case you’re making spaces, but increasing the compaction all around the spaces. Related to core-aerating the lawn, is making sure there’s no standing water. Unless you’re growing Bald Cypress or Mangroves, you want to be able to walk across the lawn and not leave a depression, or experience that squishy feeling. If your ground is that wet, you’ll have to do something a bit more structural to fix the problem–swales, French drain, gravel pit. 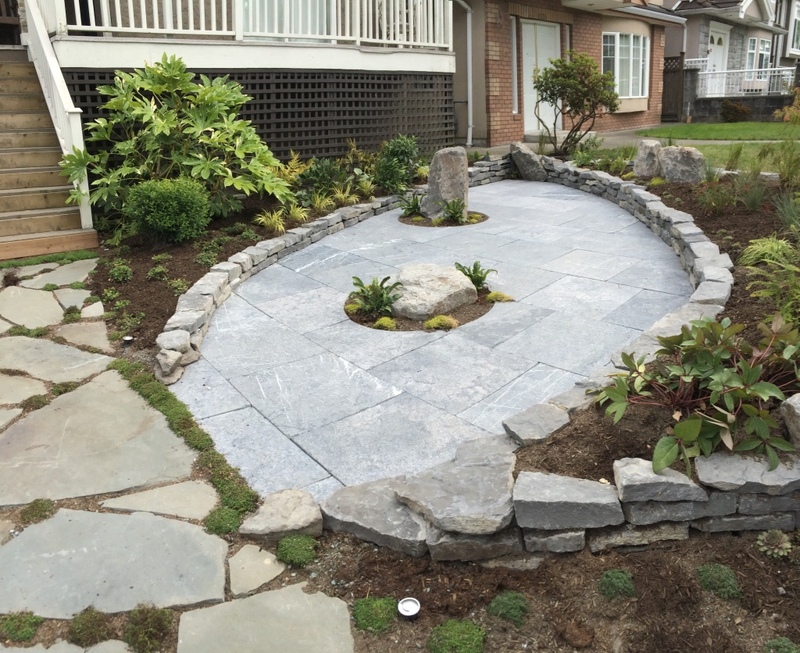 There are a number of options, all quite a lot of work but necessary if you want lawn. At least once, and even twice a year, your lawn should be “top-dressed” with ¼”-½” of some kind of well-composted matter. It may be your own compost, it may be municipal compost (this isn’t your food garden, so the “non-organic” nature of municipal compost is not an issue here), or it may be bagged compost like Sea Soil. If you’ve got a large expanse of lawn to treat, you could get in a few yards of a “turf blend” soil, which will be something like half composted yard trimmings and half sand. Rake it over the lawn so you can see all the grass blades coming through it. This will feed your soil, and the sand in it will contribute to good drainage. Adding a modest amount of organic matter to the ground every year will improve every kind of soil, from the sandiest to the clay-iest. So you’ve just given the organisms in your soil a breath of fresh air, and breakfast lunch and dinner. You’ve got contented soil. Or at least you will have contented soil if you do this every year. For now you’re on the right road at least. And once you’ve got a nice little layer of compost down, over-seed with lots of appropriate grass blend. You know that the birds are going to take their share, and there’s little you can do to prevent that. So just make sure you’ve got enough grass seed down to feed them and the lawn. I heard someone say every seed should be touching another–which means you’ll barely see the compost through the seeds! There’s been a lot of talk locally about the newest development on the block–use of tall fescue (which isn’t actually tall) grass seed. It’s pretty resistant to the chafer beetle damage (apparently they don’t find the roots as palatable as other turf grasses), and puts down deeper roots to take advantage of moisture at deeper levels. Adding a small percent of micro-clover (probably 5-10% by weight) will improve colour, summer drought tolerance,and being a legume, will convert atmospheric nitrogen into soil-bound N.
Grass plants have simple needs–like most of us; we don’t need the toys of modern life and are often better off without them. Grass needs air–we’ve dealt with that by aerating. It needs food–the organisms feed the plants, and we’re feeding the organisms with our compost, and by not killing them with herbicides and pesticides. Two more things grass needs is a neutral pH, and light! The pH is increased very gradually by “liming” the lawn. Now professionals always tell us to get a soil test to find out what is deficient before we try to correct it. And in principle of course I agree. But back to our high rainfall, calcium and possibly to a lesser extent, magnesium, are “leached” from the soil by constant rain. Now I’ve read that many times, and still don’t completely understand it, so if anyone can explain it to me I’d be grateful! Whether I understand it or not, tho’, our native soil is acidic. 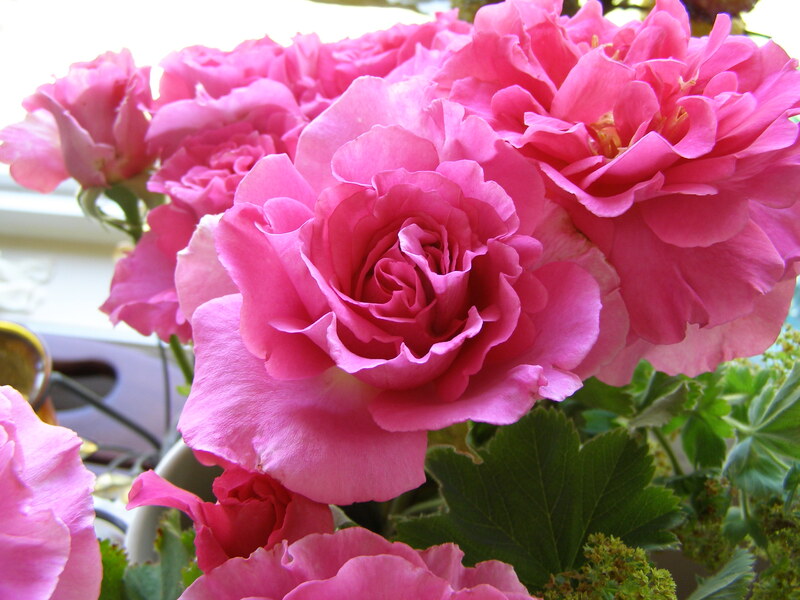 Compost breaks down to neutral pH, so adding that will aid in neutralizing your soil. As does judicious application of lime–either Calcium Carbonate agricultural lime, or dolomitic lime, which has Magnesium carbonate as well. Every resource I read suggested only liming every 2-4 years, since it is so slow to change the pH of the soil. But I remember Brian Minter saying twice a year wasn’t too much in our climate! Quite a difference. But if you stick to a maximum of 35 lbs/1000s.f., seemingly you can’t over-lime. Deal with drainage. The sine qua non of lawn care. Using tall fescue as one of the grass species in your blend will help deter chafer beetles. It will also do better in summer dry. Using a little microclover will naturally add nitrogen to your soil, and also give it more drought tolerance. Not using man-made fertilizers and pesticides–in fact natural pesticides as well–will allow the beneficial microorganisms in the soil to do their beneficial thing, and limit the negative environmental impact of your lawn–maybe even give it a postive environmental impact. Your microclover and compost will add N and other necessary elements. And all the above will help prevent snow mould should we have another winter like this one. I’ll be doing a quick tutorial on Spring pruning pretty soon, but had to throw this in for a chuckle. This is, by far, the most feared yet easiest part of rose growing! I would love to talk to the person who first tried to make it sound so difficult. 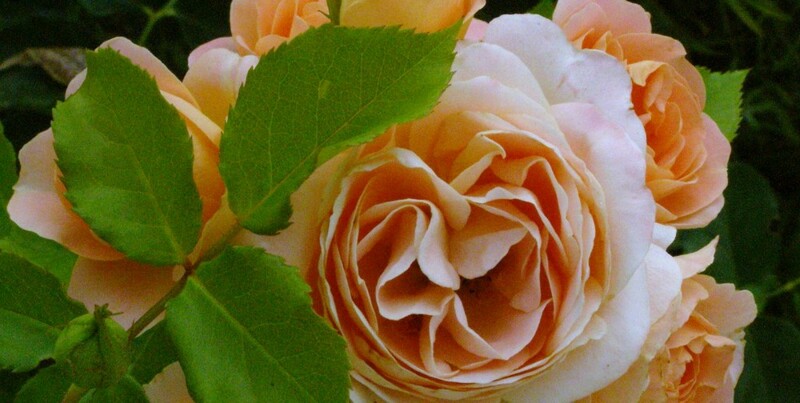 Come spend a half an hour with me, and you will return to your garden confident in your ability to prune any type of rose. 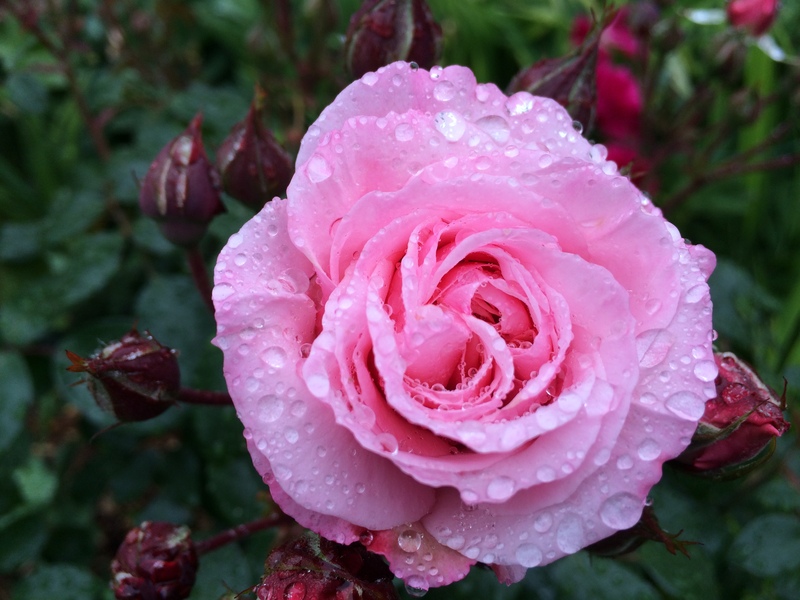 Rose ‘Octavia Hill’ in the rain. If you’re not in the area, or can’t make it, I’ll be doing my own roses pretty soon, so I’ll document it all for you readers.